Christmas and New Year are busy times for any priest. But I am also snatching moments of my own for reflection and reading. What am I reading during this holiday season? Carlo Rovelli is a theoretical physicist who was born in Verona, has worked in Italy and the US, and now lives in Marseille. The Daily Telegraph has described him as ‘the world’s most inspirational physics teacher.’ His Seven Brief Lessons on Physics, translated into English by Simon Carnell and Erica Segre, became one of the fastest-selling science books ever, selling over a million copies worldwide. It rivals Stephen Hawking’s A Brief History of Time in popularity and in the author’s own Italy it has outsold Fifty Shades of Grey. Now Carnell and Segre have translated his Reality Is Not What It Seems: The Journey to Quantum Gravity (Penguin, 2017), in which he sets out to introduce us to an exceedingly strange state of things in which there is no such thing as infinity, time as we think we know it does not exist, and the universe is the product not of a big bang but of a big bounce. Rovelli is one of the intellectual giants in Europe today. A former student activist who was jailed briefly in the 1980s for resting conscription in Italy, he is a journalist, author and a scientist. With Lee Smolin and Abhay Ashtekar, he developed the theory of loop quantum gravity. Rovelli sets out to bridge between the arts and science, and to explain why an understanding of the world requires some grasp of physics. He outlines key developments in physics from the ancient Greek philosophers and the Roman poet Lucretius to the present day, and describes how physics goes deeper than any other science into the riddle of existence. The laws of physics – gravity, energy, motion – underpin those of chemistry, astrophysics and meteorology combined. He introduces readers to the thinking of Italian writers from Dante – correcting our thinking about his circles to spheres – Savonarola of Florence and the humanist Poggio Bracciolini to Prino Levi and the pro-Mussolini philosopher Benedetto Croce. This is a book for theologians to read too. Rovelli deals humorously with Augustine of Hippo and sees Galileo as a proto-physicist who tasted the apple of knowledge and was jailed by church authorities for exercising his curiosity. But the search for knowledge is not nourished by certainty: it is nourished by a radical distrust in certainty, he writes in a chapter on loop quantum gravity theory. He argues that scientists who pretend to atheist omniscience are no less intolerant or prejudiced. In 1927, the Belgian Jesuit-educated priest Georges Lemaître first developed what became the ‘Big Bang’ theory. This Catholic priest, who discovered that the universe is not fixed but ever-expanding, personifies the modern ‘struggle with curiosity,’ and even what it means to be human. Science is not and never has been about certainty. ‘Only by keeping in mind that our beliefs may turn out to be wrong is it possible to free ourselves from wrong ideas,’ he writes. Rovelli’s book has been described as ‘an utter joy’ by the science writer and BBC broadcaster Adam Rutherford, the author of A Brief History of Everyone Who Ever Lived. Adam Rutherford’s book, A Brief History of Everyone Who Ever Lived (Weidenfeld and Nicholson, 2017) is book explaining the Human Genome Project, but one that should be read by every genealogist. The Human Genome Project revealed the true figure in 2003. We have about 20,000 genes. Which just goes to show that humans have fewer genes than a roundworm, a banana, or a grain of rice. He is critical of ancestry companies and the claims they make for DNA tests, and asks questions about Richard III’s legitimate successors and whether in-breeding threatened the survival of the Habsburg dynasty. 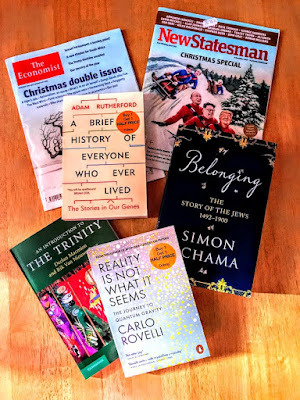 Simon Schama’s Belonging: the Story of the Jews, 1492-1900 (London: Penguin, 2017) is his second volume in his mammoth history of the Jews, He begins with the aftermath of the Inquisition and the expulsion of Jews from Iberia, in Venice, where many of the victims refugees arrived from Spain and Portugal. There, about 2,000 ‘New Christians’ or Jews who had been forced to convert to Christianity were slaughtered over three days in Easter 1506. The place of Jews in Europe in the 16th and 17th centuries was precarious. They are the eternal outsiders, excluded from landowning and the professions, pushed to the margins to work in trade and finance only to be then accused of hatching an international conspiracy in banking. This is a book of miracles and massacres, discrimination and tolerance, philosophers and poets, rabbis and composers, that takes us from the Inquisition across continents, to the dawn of Zionism and the first stirrings of the Holocaust. I remember when Declan Marmion was lecturing in the Milltown Institute of Theology and Philosophy how he told an intake of PhD students that it was presumed we had one Biblical language and one modern theological language. We would never be tested, but if it was ever found otherwise, we would be asked to leave. Today he is Dean of the Faculty of Theology in Maynooth and Professor of Systematic Theology. Some years ago, with Rik van Nieuwenhove, lecturer in theology at Mary Immaculate College, Limerick, he produced An Introduction to the Trinity (Cambridge University Press, 2010), although I only bought it shortly before Christmas in the Abbey Bookshop in Limerick. This introduction challenges the standard account of a decline and revival in Trinitarian theology, taking into account recent, alternative readings of the theological tradition by Lewis Ayres, Michel Barnes and other scholars. They analyse the scope of these new approaches, and establish the importance of a considered understanding of the Trinity, resisting the notion of separating faith and reason and identifying theology’s link to spirituality. This book is a challenge to those who fear Western Christianity is descending into a more Unitarian approach while the more Trinitarian view is being maintained by Eastern Orthodoxy. I am also reading the Christmas editions of the Economist and the New Statesman. The Christmas double issue of the Economist includes the usual selection of features on the curious and the unusual that emerge each year.